Hampshire is part of a trio of companies owned by David and Andrew Harnett. InfoSeal LLC, located in Roanoke, VA employs 85 people in a 110,000 sqft building dedicated to offset and digital production of documents and self mailers. New Jersey Business Forms (NJBF) located in Englewood, NJ employs 48 people and is also dedicated to offset and digital production of documents and general printing. Both companies operate round the clock six days a week focusing on core products such as pressure seal self mailers, full sheet and integrated die cut labels, traditional business forms (yes there is still quite a demand for plain old carbon-less business forms!) and direct mail related web offset printing. Using our new digital fast plate-making system allows us to further stay ahead of the competition. We are able to produce digital plates within an hour allowing us to adapt to and exceed our customers needs. With our experienced production team we are able to detect and resolve issues in the pre-press process and develop a job to yield the best results. Newly installed in January 2016 this 17” wide press is configured with ten colors, interstation UV lamps and various converting options. The press is configured to roll to roll and roll to sheet with the additional option of non-stop splicing on the unwind and rewind. Fast and efficient make readies, low waste and perfect quality. Perfect for short medium and long run label and packaging work. Installed in September 2016 the Tau is a 13” wide inkjet press capable of printing on nearly any material without the requirement of special coatings or pre-treatment. 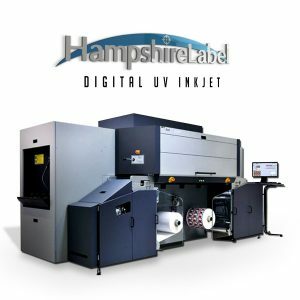 This unit at Hampshire Label is equipped with variable imaging capability for numbering and other variable label content. Perfect for short to medium run lengths the Tau is capable of flexo like quality with the low cost and quick turnaround of a digital process.